Zynga Poker Raises the Stakes with New Spin and Win Mode in World Poker Tour® Tournament Center | Zynga Inc.
SAN FRANCISCO--(BUSINESS WIRE)--Mar. 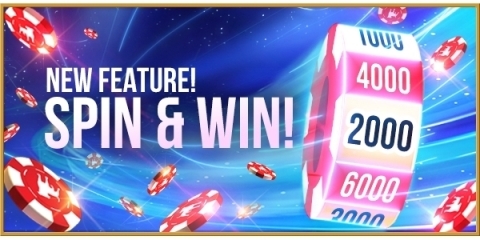 28, 2019-- Today, Zynga Inc. (Nasdaq: ZNGA), a leading mobile game developer, announced that Zynga Poker, the world’s largest free-to-play poker game introduced a new Spin and Win mode in its World Poker Tour® Tournament Center. This new mode gives players the thrilling experience of playing short tournaments and a chance to win payouts of up to 10x their buy-in by spinning a prize wheel. Zynga Poker is one of the most popular poker games in the world and now has more ways for players to compete than ever before. Designed to play like a real table experience, this Texas Hold ‘Em Poker game lets players participate in either a Sit-N-Go game, Spin and Win tournament mode or a cash table game to win generous payouts with up to nine players in either a fast or slow style settings. Zynga Poker has developed a strong community within the game supported by Leagues and a VIP program. This allows players to earn benefits and features by reaching higher tiers with exclusive chip package offerings and special game modes. Zynga Poker is available as a free downloadable game on the App Store and Google Play, with World Poker Tour tournaments accessible today.